Home » News » Universal Hero Kamal's Thoongavanam USA Release by ATMUS GKMediaUSA - Puli & Vedalam cometogether for Thoongavanam! 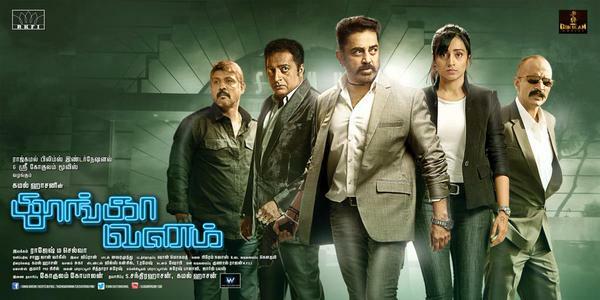 Universal Hero Kamal's Thoongavanam USA Release by ATMUS GKMediaUSA - Puli & Vedalam cometogether for Thoongavanam! October 5, 2015 – ATMUS Entertainment and SAI Ventures (MM Media) jointly bringing you the most stylish entertainer “Thoongavanam” (Sleepless Night) to the U.S. The much awaited action thriller and the hottest film in business ‘Thoongavanam’ starring iconic actor and Universal Hero Kamal Haasan and actress Trisha Krishnan and is already creating a buzz among the audiences. After the impressive trailer of the film which has reached 2.5 Million views and counting, the recently released behind the scenes video of the film shows how much hard work the film’s team has done to present it for the people. ‘Thoongavanam’s’ behind the scene has some fun moments, but is filled with serious action packed sequences, family sentiments and how Kamal, Prakash Raj and Trisha delivered it. The official trailer of ‘Thoongaavanam’ sees the actors in their best shape and casting showing off some slick action movies as comparable to Hollywood films. The powerful sound effects of the trailer ensures that the film will create a different feel altogether engaging the audience till the very end. ‘Thoongaavanam’ is based on the French film ‘Sleepless Night’ by Frederic Jardin, and the screenplay of the same has been done by Kamal Haasan himself. The film is being directed by Haasan’s former assistant Rajesh who assisted in Vishwaroopam sequels and is being produced under his home banner Raaj Kamal Films. Both Kamal Haasan and Trisha look stylish to the core in the making promo. The film also stars actor Prakash Raj who has showed his acting skills to the core in the trailer. The film also stars Kishore, Asha Sarath, Sampath Raj, Yugi Sethu, Madhu Shalini and Uma Riyaz Khan. Filled with twists and turns, power packed action scenes and great costume designing, ‘Thoongaavanam’ has gained all our attention and memento to watch it on a big screen. The film is scheduled for a grand November release worldwide. The film is expected to open as the biggest Kamal Haasan’s film in his career in the U.S.